Nigeria’s Sweetheart Genevieve Nnaji back with a bang! 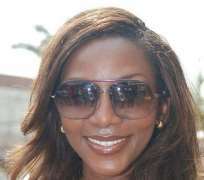 For months, fans of Nigerian megastar, Genevieve Nnaji have been asking the question. Where is Genny? The star has kept a low profile over the past 2 years. Last year, she focused on her budding fashion label, St. Genevieve, was on the cover of TW Magazine and also featured in a few select movies. The only major events that she attended last year were the Genevieve Magazine Turquoise Ball and the Encomium Magazine White Gig. Well, its 2009 and it seems like Miss Genny is back! She was at the wedding of designer, Data Okorodudu of JD7 Couture's daughter. As a friend of the mother of the bride, Genevieve was garbed in a stunning version of the wedding 'Aso Ebi'. Beautiful!